Students (individually or as a team) will be given the opportunity to present their innovations at the Innovation Showcase, October 17, 2018, and compete for the $20,000 Michael G. Wells Entrepreneurial Scholars Award to help move their idea towards commercialization. A $10,000 second place and $5,000 third place are also awarded. The Innovation Showcase is an annual event hosted by the Innovation Institute that provides University innovators the opportunity to present their ideas to an audience of investors, entrepreneurs, regional economic development representatives, local business executives and Pitt alumni. The winners will be announced prior to the Innovation Showcase. For more information on the Innovation Showcase click here. The 2018 Innovation Showcase will be held October 17, 2018, with more details to follow. Please click the link above to be notified of more updates. Previous Michael G. Wells Competition winners have progressed within the University entrepreneurial ecosystem and have participated and received additional funding through the Center for Medical Innovation and the Coulter Translational Research Partners II Program and the Pitt Innovation Challenge (PInCh). The top prize for 2017 went to Esophagel, which is developing an extracellular matrix hydrogel that can be delivered to the esophagus to control inflammation and promote tissue remodeling in patient’s suffering from Barrett’s esophagus. The 2016 winner Aeronics received additional funding for their healthcare solution, the mediPOD, after completing Quake Capital’s 14-week program in NYC. The 2015 winner Interphase Materials (Oxi-Dent) progressed to the Innovation Institute’s Blast Furnace student business accelerator and Pitt Ventures Gear Program and subsequently licensed their technology from the university and were accepted into the AlphaLab Gear business accelerator. Read their story. The deadline for receipt of applications is on May 14, 2018. Student applicants must be enrolled in undergraduate or graduate classes at the University’s Pittsburgh Campus. Student applicants must represent a Pitt technology originating from Pitt research. 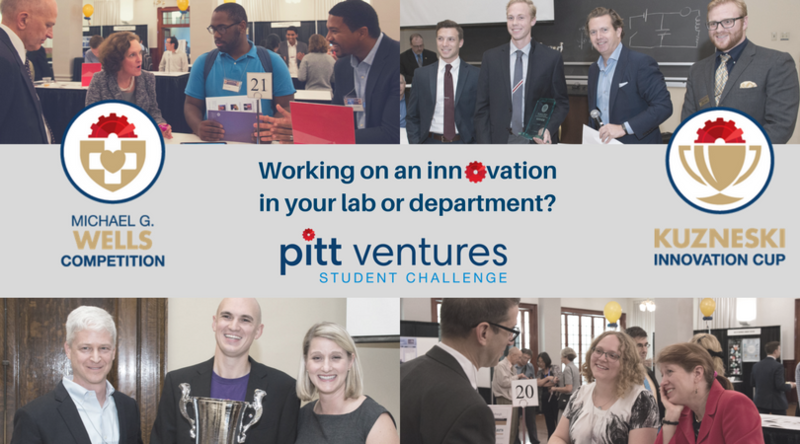 Past winners of the Michael G. Wells Competition or the Kuzneski Innovation Cup (collectively the Pitt Student Ventures Challenge) are not eligible to compete. Applications are to be submitted using the online application by 12:00 noon EST on May 31, 2019. Please note that only responses to the required questions will be reviewed; additional materials and attachments are not permitted. For team-based ideas, all team members must meet eligibility requirements indicated above. All team members contact information should be listed on one application form. The Innovation Institute is not responsible for technical problems resulting in submissions not being received. Entries will be reviewed by a panel of judges on the basis of innovation, feasibility, market potential and student motivation/dedication. Semifinalists will be notified by Wednesday, June 5, 2019. The semifinalists will be invited for interviews (in person or via Skype) during the weeks of June 10 & 17, 2019. Finalists will be notified by Friday, June 28, 2019. All finalists will be paired with a business mentor to develop a presentation PowerPoint pitch deck and deliver a one-minute video elevator pitch of their idea at the Innovation Showcase to be held October 16, 2019. Finalists will also participate in business and presentation development workshops. All Finalists will present a short PowerPoint oral presentation to the judges during the finals and will participate in the Innovation Showcase in October 2019. All judges’ decisions will be final. Winner understands the award is to be used within the University for pre-commercialization and technology validation activities. The award funds will be transferred to a University account designated by awardee and their faculty sponsor. Award funds must be expended in accordance with University policy and cannot be used for salary or stipend. Line item budgets will be required and must be submitted and approved by the Innovation Institute prior to transfer of funds. A final project report is due 12 months from date of award receipt. The University will own and protect related Pitt intellectual property rights arising from the development activities using the Award Funds. After completion of the development activities, the Innovation Institute will obtain Invention Disclosures to document, assess, and protect the intellectual property. If the University licenses or commercializes any intellectual property, the awardees considered to be inventors, creators, or developers will receive a share of proceeds consistent with the terms of the University of Pittsburgh Patent Rights and Technology Transfer Policy (11-02-01) or Copyright Policy (11-02-02), as applicable. Entrants may apply to both the Kuzneski Innovation Cup with non-healthcare applications and Michael G. Wells Competition for healthcare applications if appropriate, but can only participate in one competition. The selection team will determine which competition is most appropriate for the applicant.